Index SOLD Price: $NZ 50 (estimate) Available on Order - expect 1 week for making and delivery. Earring styles go in and out of fashion depending in large part on whether current hairstyles cover or expose the ear. Earrings comprising gem and cut-out metal forms (opus interrasile) make their appearance in Rome, c. 2nd century BCE, and long dangling earrings became popular again in the Renaissance. Coral has been considered a protective 'stone' since earliest times - parents routinely attached a piece of Coral to their babies' clothing, or had them wear a coral necklace, in the hopes of improving their child's chances of survival. 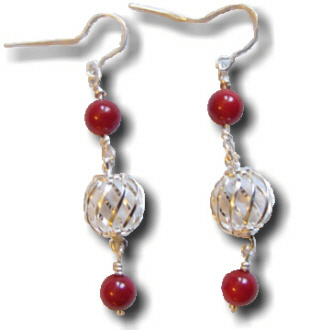 The coral is natural Bamboo Coral (dyed a deeper red) and is not under threat of extinction. The Sterling Silver (925/1000) spheres are sourced from the US, and the Fine Silver (999/1000) connectors and ear-wires are handcrafted on the premises.